As we celebrate our 200th episode, we also bid farewell to Dan Webb who has graduated from college and is starting his career. All of us are sad to see Dan go, but happy to send him off with a little reminiscing and more than a little roasting. Benet Wilson joins us and is particularly distraught. Happy 200! We are joined this week by PCDU team member ATC Ben as we access the archives and go back to the first couple of Australia News Desks from 2009 (oh dear…cringe worthy stuff). In the news, Air India’s 787 flights to Sydney may be delayed by legal wrangling between the company and Boeing over production delays, United decided not to operate 787s to New Zealand, Qantas announces a new design for uniforms. 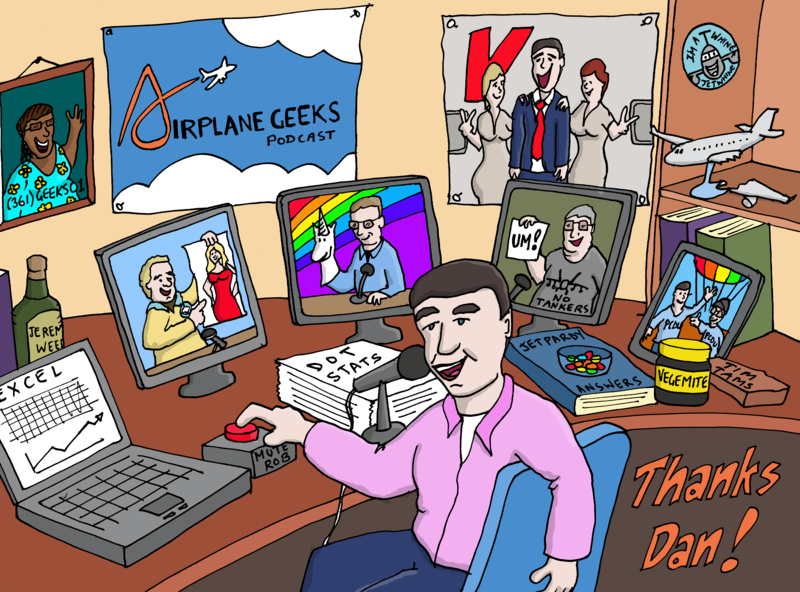 We chat about what being part of the Airplane Geeks has meant for us, and wrap up with a big farewell for Dan. 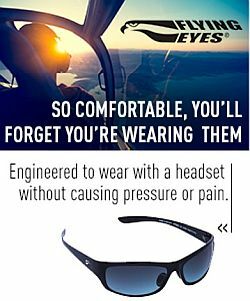 Pieter Johnson brings us news of the new aviation Xtended podcast he has started with Tim Robinson from the Royal Aeronautical Society, and Gareth Stringer from Global Aviation Resource. Louis Smith, President, FAPA.aero, formerly FltOps.com. Pilots Without Pants: The AACGNY Calendar for 2013 from the Antique Aeroplane Club of Greater New York. Post cartoon courtesy the art department at Thromby Air, the lowest of the low. Remember, at Thromby Air, they take low cost air travel to it’s logical extreme! Be sure to follow them on Twitter as @Thromby! This entry was posted in Episodes and tagged Airport security, Bush Intercontinental, incident, United Airlines, William P. Hobby on June 5, 2012 by maxflight. The crying (or is it just whiny laughing…) on this episode makes me want to puke. The single most annoying episode of the Geeks. Best of luck to you, Dan! I’ve enjoyed listening to the past couple years, and let me tell ya, as a recent grad myself (last year), those Excel skillz come in handy! I am sorry that Dan is leaving as I enjoyed his knowledgeable comments. But as a regular reader of his blog I have lost all respect for him because he abandoned his blog without an explaination of why. Hopefully in the future he will learn respect for his readers if he does start another blog. It turns out BoardingArea took his blog down a little too fast and Dan didn’t have a chance to say goodbye. So Dan does that in the post above. Max, my humble apologies to Mr. Webb. I am not a reader of cranky so I did not see this. 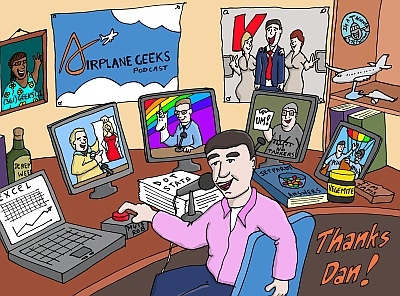 I Hope that you can find someone with the ability to cover airline management and finances as that is a valuable part of the podcast that he was very good at. Congratulations on achieving podcast #200. You have produced THE podcast rallying all interested in aviation, AIRPLANEs et al , from young to old (including me) , from tangentially interested, to the serious GEEKS. Best of luck to all of you as this represents a love and commitment to all who love aviation. Dan, best of luck. Congratulations on graduation from college and on the opening of the next chapter in your life. You will be missed. You are already successful and will continue. You have made a difference to this podcast. Now make one in the industry of your passion.